Winterground Fairlands - A World Of Funmagineering! : Repairing the audio on a Pac-Man arcade board. Repairing the audio on a Pac-Man arcade board. I got this knockoff JAMMA Ms Pac-Man arcade board many years back. It's got two ROMs instead of the authentic board's 6 (9 for Ms Pac), and is substantially smaller than the "real thing". The only issue is that the audio is poor... REALLY poor. It makes sounds but they're... wrong and noisy. 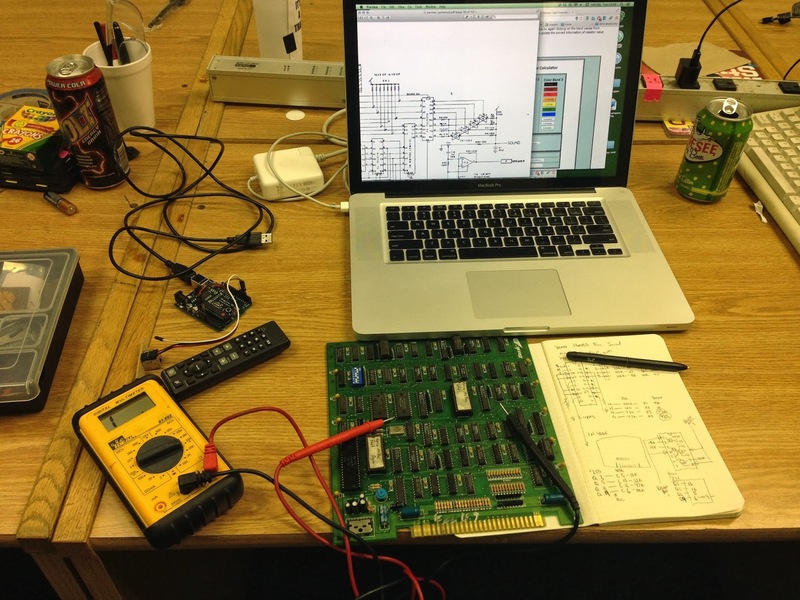 I traced the audio circuit on a real Pac-Man schematic (seen on my laptop's monitor), and buzzed it out on the Yenox board to try to corrolate the two. 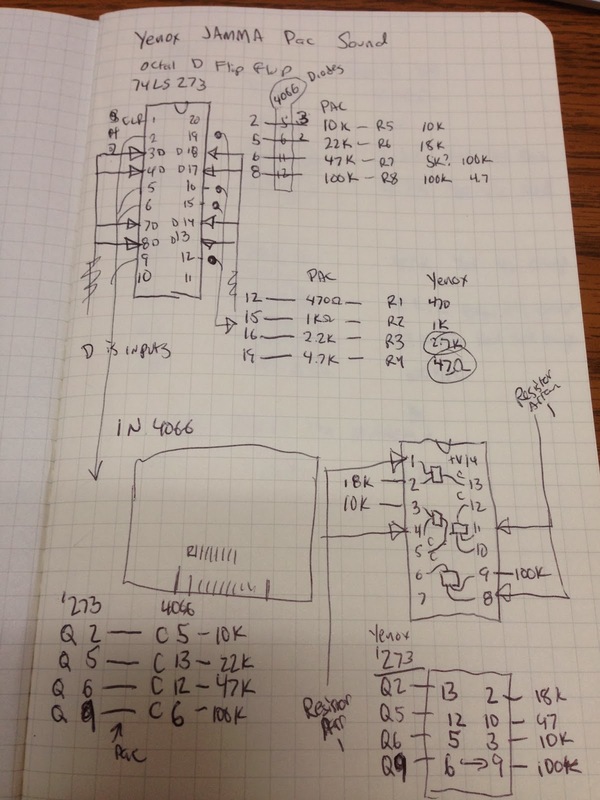 I had to trace four similar paths from a quad flip-flop, through a quad bidirecional switch, to the audio output. It got really confusing at times, and took me probably a bit longer than it should have. For the most part, they were pin-for-pin correct as far as how they were wired. These chips have the same device (eg, a flip flop, or a logic gate) repeated 4 or 6 times. In some cases here, the Yenox board had a different one of these devices hooked up, which added to the confusion. 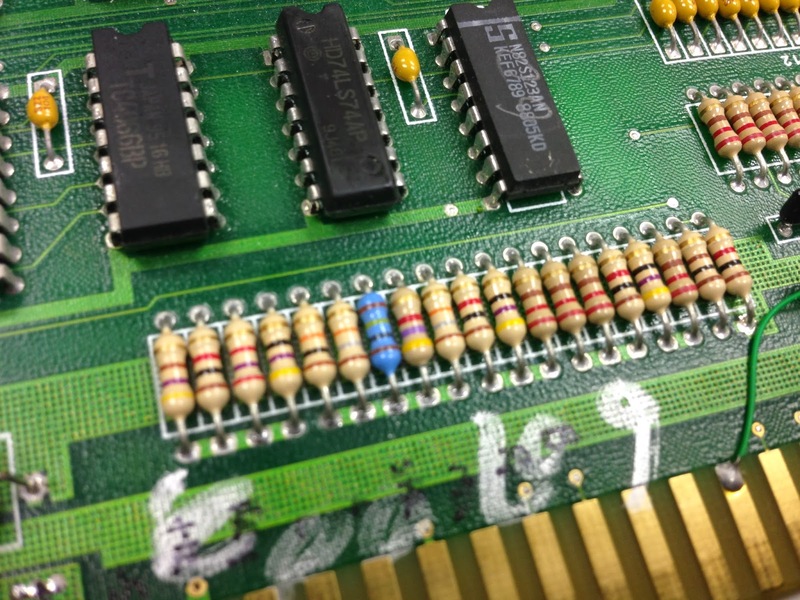 You can see these resistors here on the Yenox board, right next to the JAMMA connector. They start from the left with R1 (my notation.) The printing on the board completely matched the resistance values that sat on them, so it's obvious that the engineer who made this board seriously screwed it up in the design stage. I replaced resistors R3 - R7. I put them in with the gold band closer to the JAMMA connector, rather than the other way around. And now it sounds near-perfect. There's a little bit of popping left, but I was getting tired and decided to head home for the night. 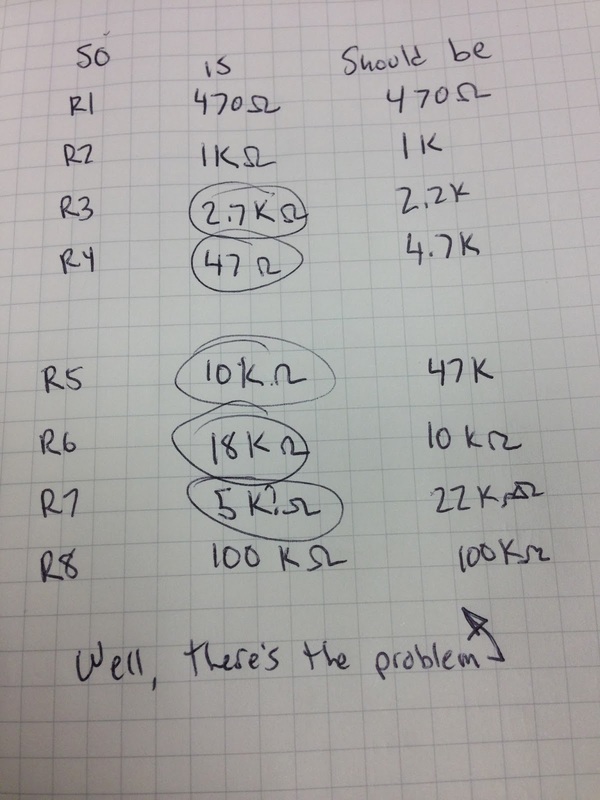 I'll hook it up to an oscilloscope at some point and see if i can figure out which line is causing problems. For what it's worth, I also did the same as this on the video path DAC, seen in the above picture as the next three groups of resistors. In the above, the group of four and then the group of five are for audio, then the next group of three is for the "red", next three for "green", next two for "blue", and the remaining two are for the sync. 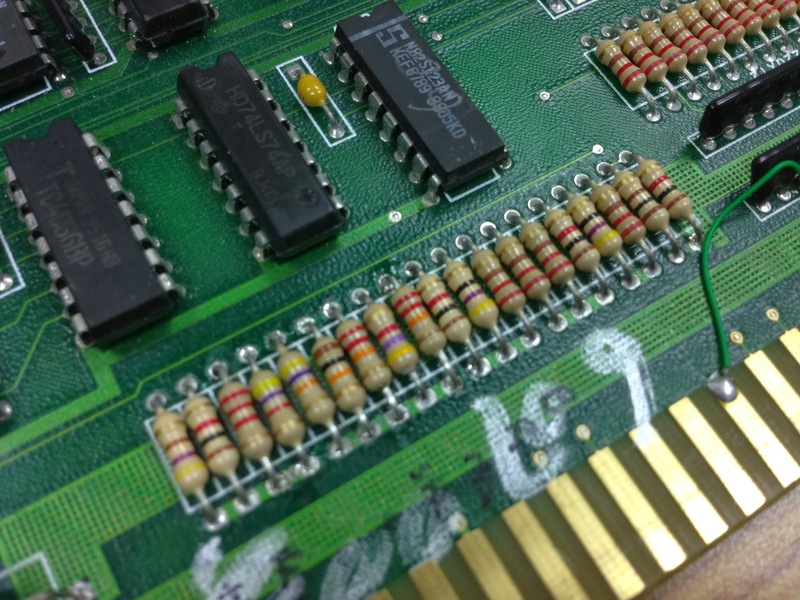 Again, there were some 47 ohm resistors mixed in, and notice two of the three in the "green" section are identical (red-red-brown)... which is surely wrong. Color is now perfect on the board too! This post originally appeared on the Interlock project blog 2/2014.